In honor of Valentine’s Day, I give you Root Beer Cake. I first had this cake in Richmond in a quaint, cozy restaurant called The Roosevelt while visiting two good friends of ours. The restaurant is a neighborhood joint that sits on a corner in Church Hill, Richmond’s oldest neighborhood. Their menu features modern takes on Southern classics, regional beers, craft cocktails and apparently, delicious desserts! The cake I had in their restaurant was actually termed, Coca-Cola Cake, but since I didn’t have Coke, I tried Root Beer instead and it was equally as delicious. The soda gives it a nice fizz, helps make the cake rise and the icing is a buttery, sweet light chocolate concoction that of course I had to sample multiple times while mixing. I think the next time around I may add even more cocoa powder to the icing. 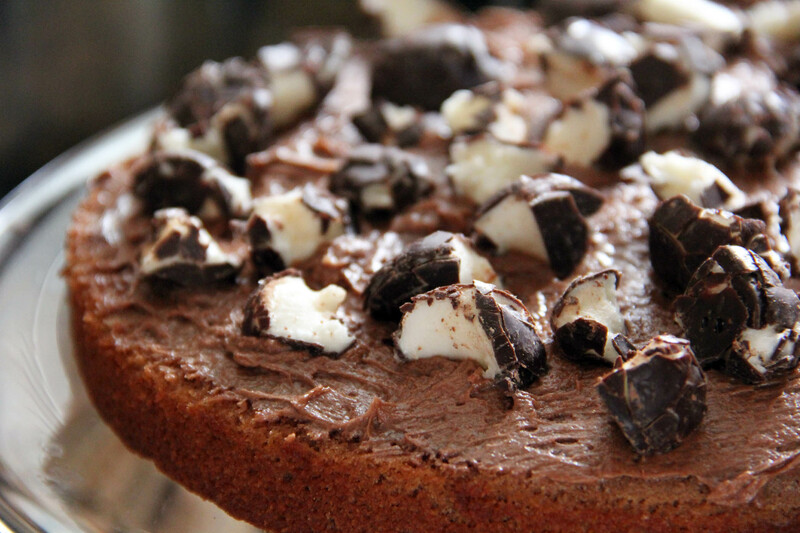 By the way, this cake is even better the next day when the marshmallows have a chance to soften up between the layers. Preheat oven to 350°. Get out two 9-inch cake pans and place each one on a large piece of parchment paper. Trace each pan with a pen or pencil, cut out the circle and set aside. Use a tablespoon of butter to grease the pans, lay down your parchment paper into each and then turn the parchment paper over so the greased side sits face up. In a mixing bowl, beat 1 1/2 sticks butter with sugar on medium speed until light and fluffy. In another bowl, whisk together the flour, cocoa powder and salt. Set aside. In a third small bowl, whisk together the Coca-Cola (or Root Beer) and milk. Add eggs, one at a time to the butter/sugar mixture, scraping the sides of bowl as you go. Next, incorporate your dry and wet ingredients in three batches. Start with your flour mixture, then the milk/coca-cola mixture and repeat til everything is combined well. Divide the batter in half, spoon into your cake pans and place in the oven for 25-30 minutes. (I started checking at 20 minutes just to be on the safe side, but for my oven 25 minutes seemed about right). When a toothpick comes out clean, remove cakes from the oven and allow to cool completely. While cooling, time to make your icing! In your mixer, beat the butter at medium speed for a few minutes. (Note: I accidentally used SALTED butter for the icing and cake. I didn’t realize it until I had already incorporated everything. Be sure to use unsalted, otherwise you may wind up with an icing that is a little too salty for your liking. It was still delicious, but I won’t be making this mistake next time!) 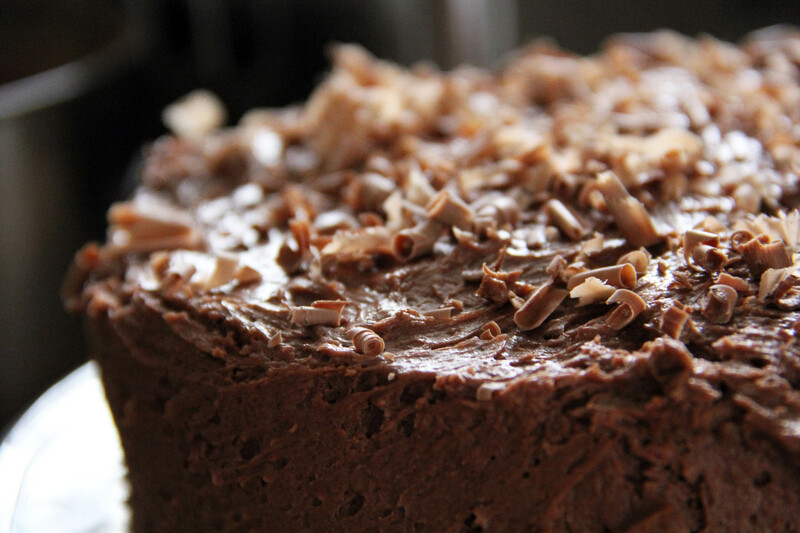 In another medium bowl, place the confectioner’s sugar and cocoa powder and whisk lightly. Turn off mixer, add the sugar-cocoa mixture and combine on low-speed. Add the vanilla, salt and milk and mix for a few more minutes til light and fluffy. Try not to eat most of the icing right then and there. 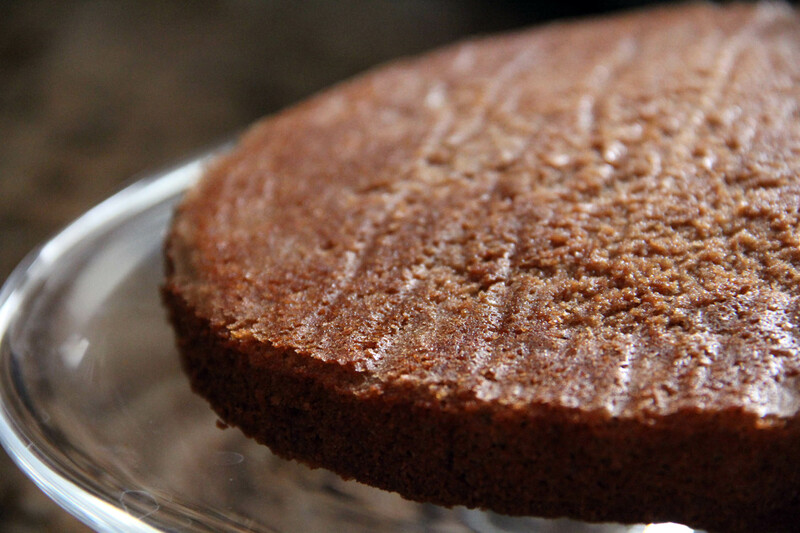 When the cakes have cooled, remove from the pans, peel off parchment paper and place the first layer on a cake stand. Add some parchment under the edges so that when icing you don’t have to worry about getting chocolate all over your stand. 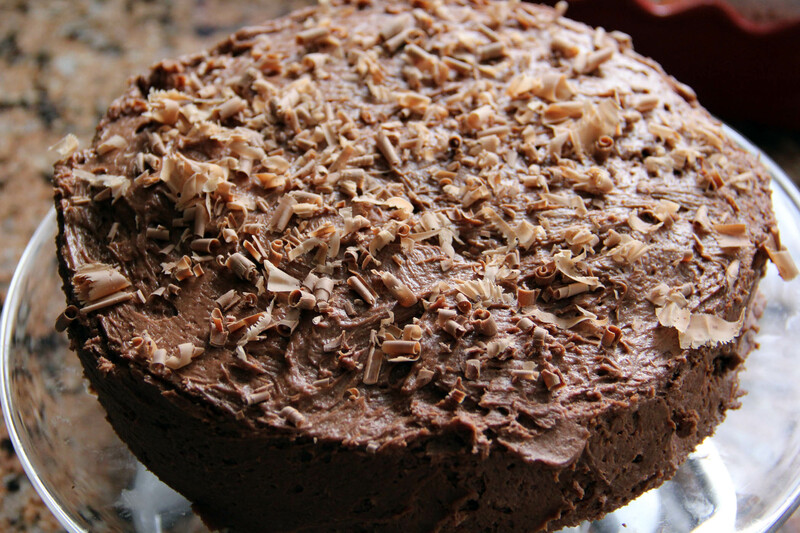 The picture below shows the completed cake before I added some chocolate shavings. 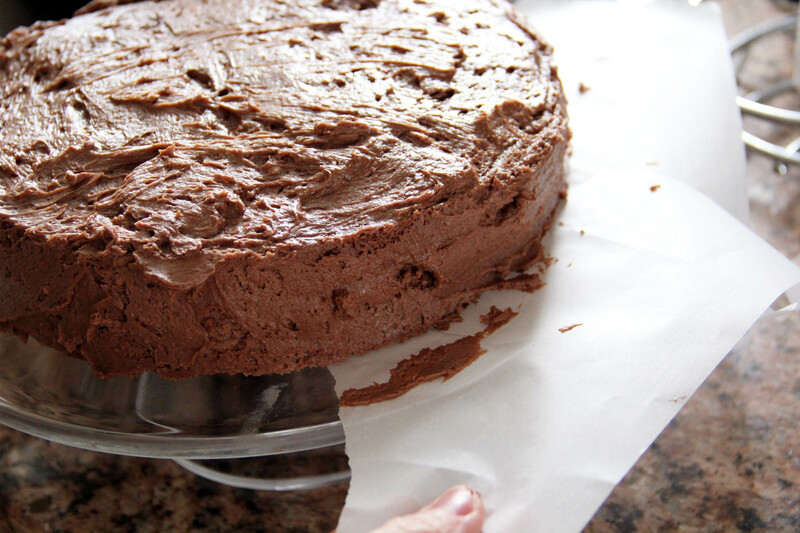 Simply just drag the parchment paper out from under your cake and you have a perfectly clean cake stand. Spoon about one-quarter of the icing on your first layer. I added some chopped up chocolate covered marshmallows at this point (marshmallows are optional) but I remember the cake in the restaurant having them. Top with second layer and use the rest of the icing to frost the top and sides of the cake. 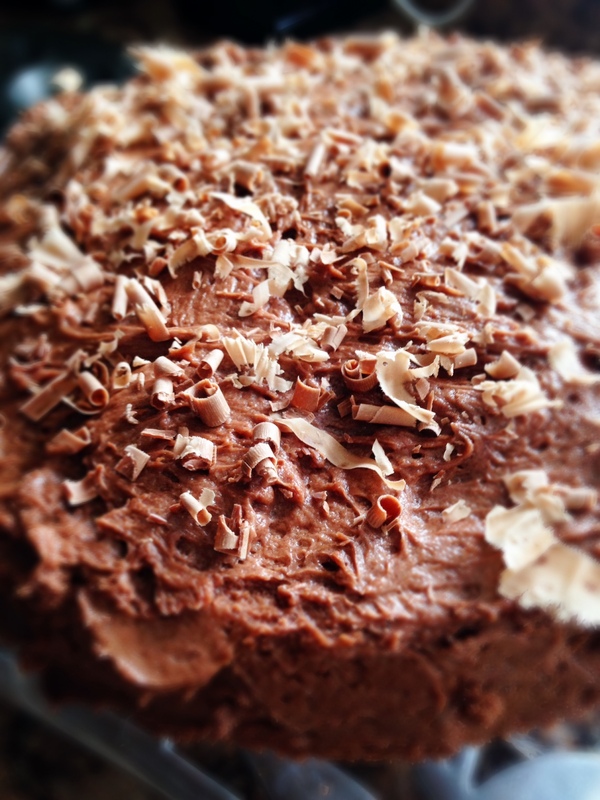 I found a milk chocolate bar in the pantry and added some grated chocolate curls to the top for decoration. The cake turned out beautifully! It has a light chocolate flavor, not a deep, rich chocolate flavor which is why next time I would probably add dark chocolate curls and some more cocoa to the icing, but it was really quite tasty and different. The cake is super moist (sorry, everyone) due to the soda, and an all-around a great cake recipe to have in your repertoire. I hope all of you have a wonderful Valentine’s Day, whether with your sweetie or swingin’ single. Enjoy! Yum.i really liked! 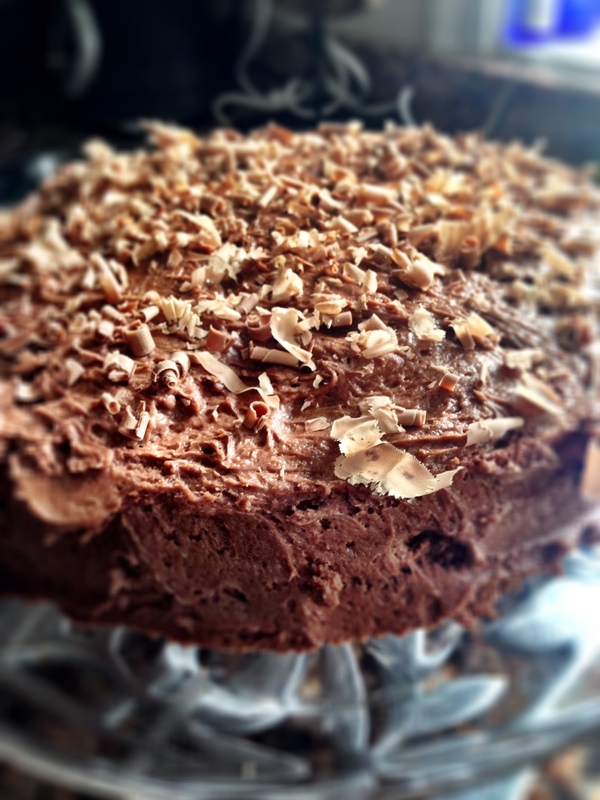 And i actually liked it with the lighter choc frosting.